Private Internet Access is by far the best VPN on the market. A VPN truly dedicated to privacy with tons of tools that allows 5 simultaneous connections is hard to come by! With access to over 24 countries and a more than fair price point, PIA VPN is hard to beat! Private Internet Access is the all-in-one VPN. 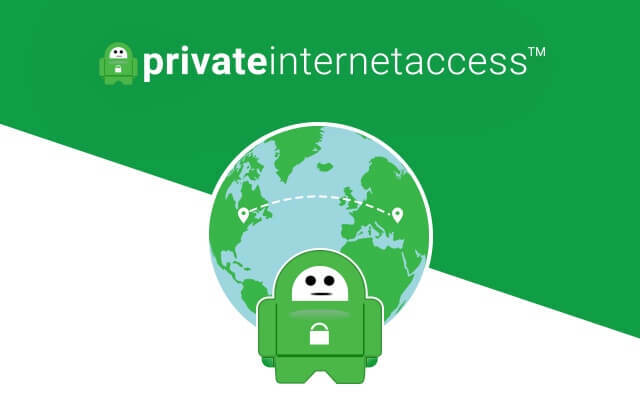 Private Internet Access is an older established VPN who has been providing secure VPN access since 2011, making them industry veterans for over 5 years now. Private Internet Access is among VPNFTW’s top VPN’s marking itself as our #1 overall VPN for everything from speed, to security to even customization. This is the all-in-one VPN, read our Private Internet Access review to find out more! Private Internet Access has a very basic pricing structure with three packages to choose from. All three packages come with the same features, just a longer subscription period. Among their three packages, Private Internet Access (PIA) offers one month at an extremely affordable $6.95 per month, a six month package for $35.95 ($5.99/mo), and one year for the extremely low price of $39.95 making it a mere $3.33 per month! 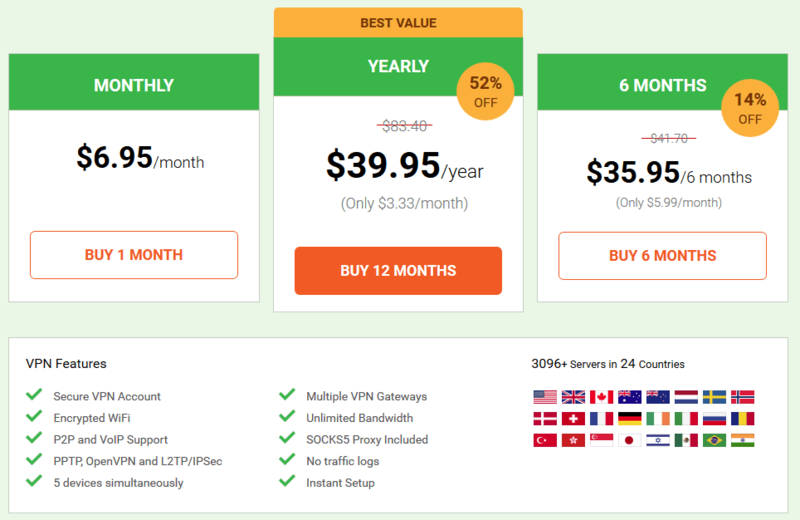 No other commercial VPN service can offer the features, stability and speed for their minute and fair price point. Just one of the dozens of reasons to switch over or choose PIA! Private Internet Access may not only be #1, but it’s friendly on your wallet as well! Private Internet Access is one of the very few VPN’s who actually provides users with features that put you in control of your privacy! Atop the extremely price friendly VPN the company provides, the VPN is jam packed with dozens of features including multiple protocol support, extensive device support, bittorent support, port forwarding, DNS leak protection, VPN kill switch and a SOCKS5 proxy is included. Spanning over 24 countries and hundreds of locations Private Internet Access can secure up to 5 devices simultaneously! Private Internet Access offers a majority of their features right within the VPN client that is accessible from Windows, Mac OS X, iOS and Android. Their customized client contains tons of features, some of which we listed above being their exclusive VPN kill switch and DNS leak protection modules. Both features are key and Private Internet Access has them mastered, ensuring your connection stays secure no matter what happens, even if your internet connection completely drops. One thing that distinguishes Private Internet Access from others is the fact that their features are actually useful and no additional bloatware comes pre-installed. Private Internet Access is among the top providers that actually provides full transparency and real secure encryption. While using most VPN’s, when you boot it up you have no idea what’s going on on the back end, not what protocol it’s using to secure your connection nor if the connection is even secured from threats. However, Private Internet Access puts all this behind them by allowing you to choose the level of security you desire. If you’re looking for an extremely fast connection with little to no security, go ahead and change the settings. If your looking for a slightly slower yet heavily secured option, go right in the settings and make one click and you’ll be secured. How do they this? By letting you choose the encryption. Instead of trying to explain, we will go ahead and show you. 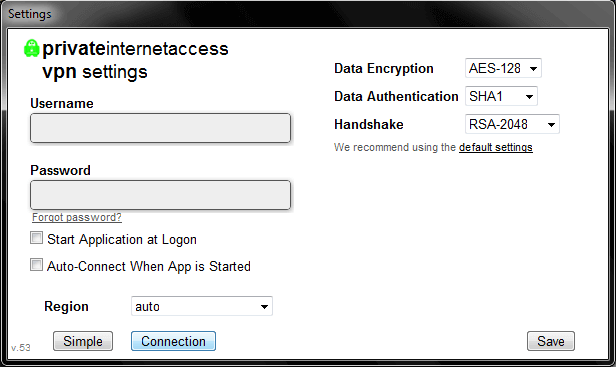 As you can see Private Internet Access lets you choose the encryption algorithm, authentication algorithm as well as the handshake. All three drop downs contain a variety of options to choose from. Even if all this technical talk sounds like mumbo jumbo don’t worry, the VPN chooses a stable and secure encryption algorithm by default, however they allow you control if you wish to change your technical setup. One thing we did dislike is that the VPN operates under the jurisdiction of the United States of America, meaning the company is vulnerable to the United State’s heinous and invasive laws and gag requests. However no public knowledge of any PIA user being turned over to the authorities has occurred. Aside from this, Private Internet Access keeps no logs, time stamps, IP addresses or any other type of data on customers, again making this #1 for security. Private Internet Access is established in the realm of security and privacy with dozens of features that put you back in control of your privacy! Private Internet Access has blazing fast speeds across nearly all every single server. Whether it’s in the USA, Canada, Russia or Germany, the connection speed is phenomenal. Occasionally during peek hours Private Internet Access may have its times where it takes an extra second or two, however nothing major. After using Private Internet Access for several years, speeds remain surprisingly consistent, always pushing through full power on OpenVPN. Here are some speedtests, what we have on a daily average after using PIA for years. One downside to Private Internet Access is their customer support. While the VPN gets 5 stars in every other category, customer support does not. While the company offers an extensive client setup page with guides for nearly any device, you may still run into trouble requiring you to contact support. Getting customer support for the VPN is extremely slow, presumably being bogged down with hundreds of tickets. 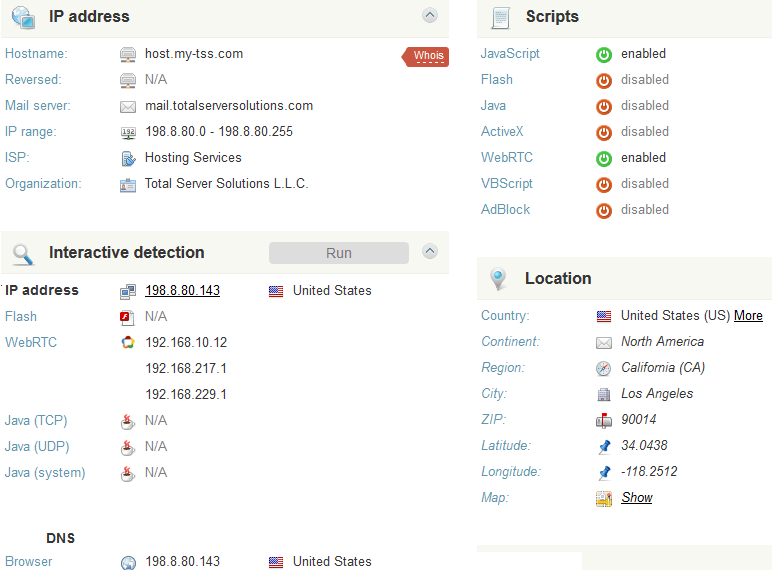 However, over the past two years while using this VPN this issue has always persisted, extremely slow customer support. And by slow we mean days will pass without getting proper assistance or a reply from support. Generally after two or three days you may receive a reply back. We just feel this is far to long. While yes the VPN is stellar with little to no issues, if you do run into one, you better be prepared to wait a few days for a fix. Once you do get in contact with support though, they are quite knowledgeable and have helped us resolve all of our issues quickly once we got in contact. Signing up for Private Internet Access is a breeze, with their simple panel all it requires is a valid email and payment information. Supported payments include credit cards, Amazon, anonymous bitcoin, CashU, OkPay, Ripple, PayPal and even gift cards from nearly any retailer! After you send your payment it is immediately processed and your account is instantly activated. You will receive an email with your username and password along with a list of supported clients. From there you are able to begin setting up your VPN! Probably one of our favorite parts about Private Internet Access is their Windows VPN client. As stated earlier in the review, the client holds a long list of features and the company has dedicated their entire client to ensuring your connection remains secure under any circumstance. After downloading their Windows installer with just a few clicks Private Internet Access had installed all their files and a new tap driver in just a matter of seconds! All the features names speak for themselves but work perfectly! 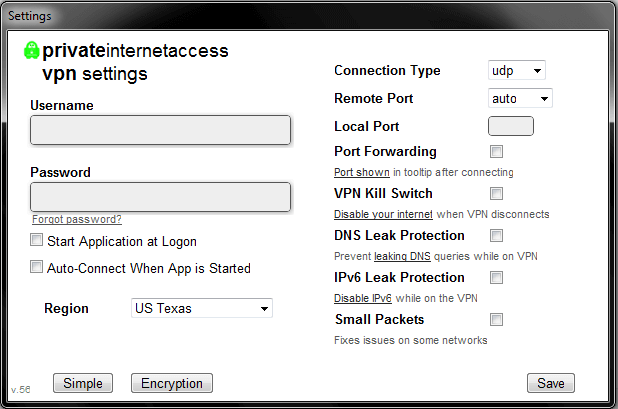 The VPN Kill Switch is a great feature that will kill any connection that tries to run outside the VPN. Meaning if your VPN fails, your entire connection will too. This ensures optimal security that no packet leakage ever occurs and if your VPN suddenly becomes disabled, your connection will instantly die with it or til it’s reconnected. This is great when leaving your PC on for extended periods of time, this will ensure the VPN never stops securing your connection and if it does the connection will cut while you’re away. DNS Leak Protection is a key feature that ensures no DNS leakage occurs by setting your DNS servers to PIA’s dedicated DNS servers (209.222.18.222 and 209.222.18.218). If you don’t know what a DNS Leak is you can read more on our check if your VPN is secure guide. In short, if your DNS queries are leaking this means your DNS provider, presumably your ISP, can see every domain you visit, however not the contents on the webpage. This defeats quite a huge factor of a VPN as its main point is to secure your connection, web requests and mask you online. This feature is key and Private Internet Access was one of the first big providers to implement it. IPv6 Leak Protection disables IPv6 traffic entirely while using the VPN. This ensures that no IPv6 traffic leaks out over your normal internet connection when you are connected to the VPN. This includes 6to4 and Teredo tunneled IPv6 traffic. This will not block IPv6 on Windows XP if you have manually enabled it. Small Packets is a new feature that Private Internet Access just implemented and hasn’t released any official documentation on, so we don’t want to comment on what it is without official documentation after we used it. Another great part about this Windows client is the encryption settings! 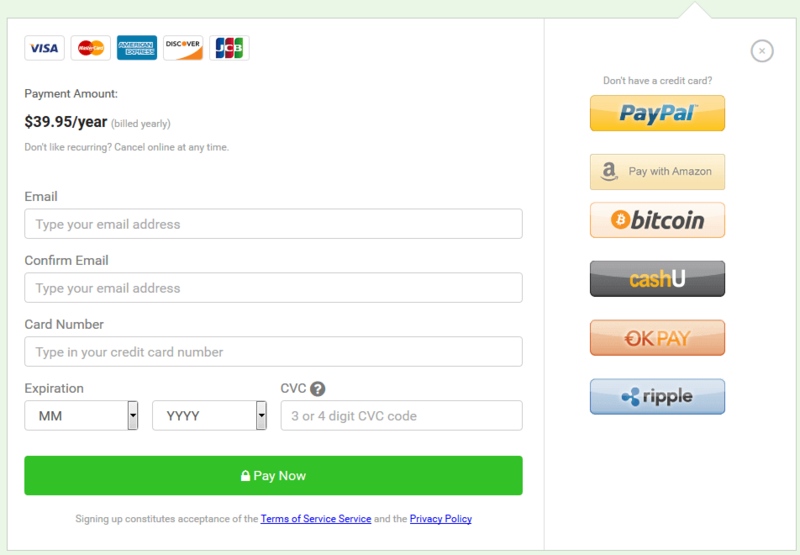 Never once have we seen crypto settings this extensive packed into a VPN. In our features tab we outline the crypto tab quite extensively, however it’s still worth noting again. The encryption tab allows you to set your desired encryption algorithm and security standard. If you want a high security VPN with the highest encryption possible PIA allows you to do so. If you want maybe lower security standards for a more lenient connection. they allow you to set that as well. They honestly put privacy in the hands of the consumer, no BS! We currently don’t have any other active devices to take pictures of this VPN on but Private Internet Access’s dedicated clients for Mac, Android and iOS are simply amazing. The Mac OS X version is almost a direct mirror of the Windows version, however sometimes newer features may take a bit longer to be pushed out over the Mac client. Though the client works perfectly just like the Windows client, something many VPN’s lack, general support for Mac! The Android and iOS VPN clients are a condensed version of the Windows client minus a couple of the security settings. However both clients on Android and iOS work flawlessly and we have not had a connection drop, fail or appear insecure while using it for several hours! Something most VPN’s struggle with on mobile devices. Here at VPNFTW we like to do what we call a security test. This is where we test the VPN client right out of the box with the default settings and seeing if it really secures our connection right from the start. Through a series of test we will check and see if Private Internet Access VPN is actually protecting us and if it can handle extensive tests to ensure no leakage. If you want to do your own tests you can head over to our check if your VPN is working guide. To start we booted up Private Internet Access on a California server right on our Tomato VPN router. Success, zero leaks! Now lets do an extended DNS leak test. Private Internet Access proved successful once again. Also while using the Windows client and testing for DNS leaks dozens of times we never experienced one leak, with the DNS leak protection checked on or off. Overall Private Internet Access has been our number one VPN for years and it’s simple why, it works. No crazy bells or whistles, just an honest-seeming VPN with support for dozens of devices at a more than fair price point. Private Internet Access takes the spot with five stars in speed, features, stability and privacy. Something no other VPN we have tested over years can provide. It simple, Private Internet Access is truly the all-in-one VPN, and no we weren’t paid to say that! Take me to get the All-In-One VPN!